Software Producer Betsoft Gaming has prepared an adventure of epic scales, which comes as the latest addition to the company's Slots3 collection. This latest release is titled Giovanni's Gem and is bringing a hidden world of fantastic riches to a device near you. Giovanni the Gem Hunter starts leading expeditions into the Valtara forest from 25 August 2017 at all Betsoft platforms across the globe. Betsoft's Head of Product Development, Dan Cooper had the following to say about their latest release: "The 7x7 grid in Giovanni's Gem is an arrangement that is rather unique." "This expanded grid offers an unprecedented chance for many explosive cluster wins and the formation of valuable Diamonds. Gems are a popular element in many games and we think the raw, uncut shapes of the gems and crystals in Giovanni's Gem are appealing and provide a great contrast to products already on the market." Your extraordinary quest takes place at a 7×7 reel setup and as soon as you launch it, you will be introduced to Giovanni, the Gem Hunter, who will light up your way with his torch throughout the game. Your assignment is to explore the hidden cave to uncover raw and uncut gems. The breath-taking and vibrant scenery comes with a flawlessly matching soundtrack and an overall exciting gameplay experience. In addition, the slot features with cluster wins, which implies that five or more adjacent matching stone will explode, making room for more gems to fall down from above, thus offering plenty of chances for extremely lucrative chain wins. High value symbols are represented as sacks with gems and torches whereas pickaxes, emeralds and rubies stand for mid-value symbols. Low-value payouts are delivered by sapphire, amethyst, citrine and coal symbols. Diamonds are the most sought-after gem and matching these produces a high payout, while the symbol representing Giovanni himself is the key to the game's bonus features. Matching three or more Giovanni features anywhere on the reels produces a payout, while five or more unlocks the Free Spin bonus, in which more Diamond symbols appear. Get the torch and pickaxe and start digging for emeralds, rubies, sapphires and other gems to win bumper payouts wherever you. The latest Betsoft slot release is available to play by wagering between 6.0 and 1500.00 per spin. 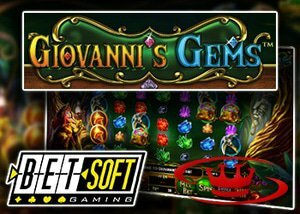 Look for the New Giovanni's Gems Slot at all Betsoft providers channels. Enjoy a Betsoft no deposit bonus when playing this fabulous slot. These bonuses are the best way to try a new casino. On this site we give tips over new casinos all new latest signup free spins bonuses as well as Casino reviews with latest deposit and no deposit bonus offers for desktop and mobile player. As an online betting review site, we recommend you visit Joreels Bonus Casino the number one choice for real money Canadian punters. The site offers an attractive welcome and new players can claim a 100% bonus worth up to $200 plus 50 free spins on deposit. The free spins are rewarded across 5 days at increments of 10 per day and are subject to wagering of 45 times. Be sure to keep an eye on the promotions page of the website so you don't miss out on exciting deals. If you want to play the new new slot Giovanni's Gems why not visit Joreels Bonus Casino today.